i love to do layering for my outfits and i think a blazer is a very good investment for your wardrobe. Of course it is a staples office wear, but today I will show you how to add a little more fun with it. I received this classic long black basic blazer from Persun Mall recently and I adore how it fits in a simply sophisticated silhouette. persun mall blazer and ring. shop style frontier shorts and necklace. f21 tank top. aldo shoes. h&m bracelets and flower crown. 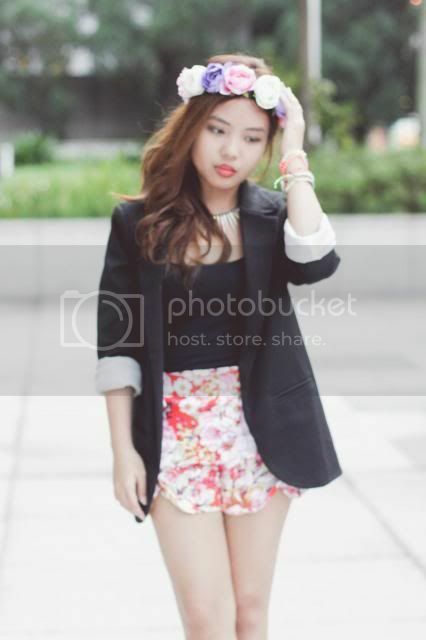 Paired the blazer with colorful floral shorts plus rainbow bracelets that I just bought that day. I'm in the mood for something colourful lately, but i'm avoiding to look too girly. 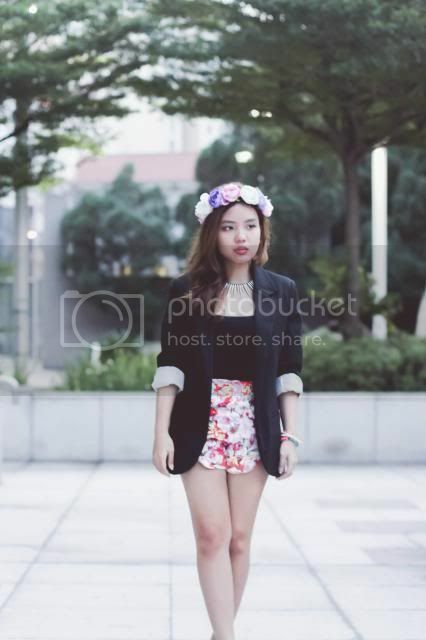 Juxtaposing the spike necklace and feminine flower crown makes a balance for this outfit, what do you think? I bought this colourful charm bracelets together with my friends, it becomes a sort of stylish friendship bracelets. The shorts and necklace i wear is now available at Style Frontier shop, please email for any inquiries. I started a new job this week, involving in photoshoot (something that i love obv), but life just can't get any busier! For some of you in Indonesia, it must be a week long holiday, but not in Singapore hahah. Wish me luck for the work ;) and happy idul fitri for those who celebrate it! layering sure is the way to go. you look amazing! Ps. thanks so much for your comment! Your future plans sound brilliant, what kind of career are you planning on going into? I think the floral shorts are very cute! Love you outfit, it so chic!! Love your exceptional styling in this outfit, you look fantastic hun! Thanks for your kind visit, wish you well for the rest of the week! Such a lovely look! Love the shorts! I love how you add more colors in your outfit through the shorts and accessories ^^ good luck for the job! cute outfit, i love the bright florals with the black! I agree with adding the blazer bit.. I feel an outfit is never complete without accessories or an outer wear. love your blog. following you! :) care to return the favour? I heart that blazer--it is perfect with what you're wearing and such a great staple! Love this look - so many unexpected combinations! The shorts are gorgeous, and they look even more fab because of how you styled them! nice headband shoes and bracelets! gorgeous outfit! you look fabulous! i adore your floral shorts! just followed you dear, stay in touch. love this outfit. Cute look girl! 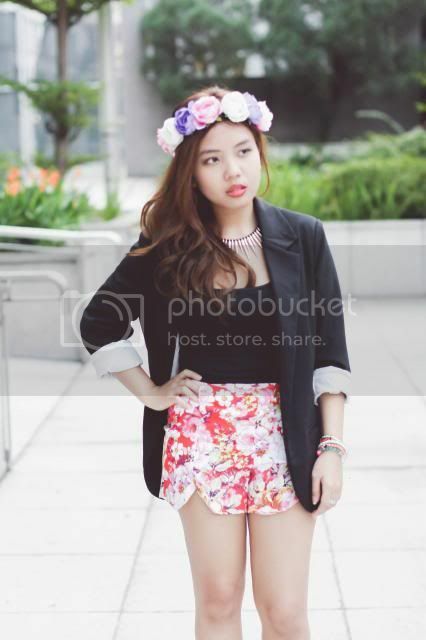 Love your floral headpiece and floral shorts:)! Perfect outfit love. You look gorgeous and yes the floral shorts and head dress is so beautiful. I want that head dress hahahah! 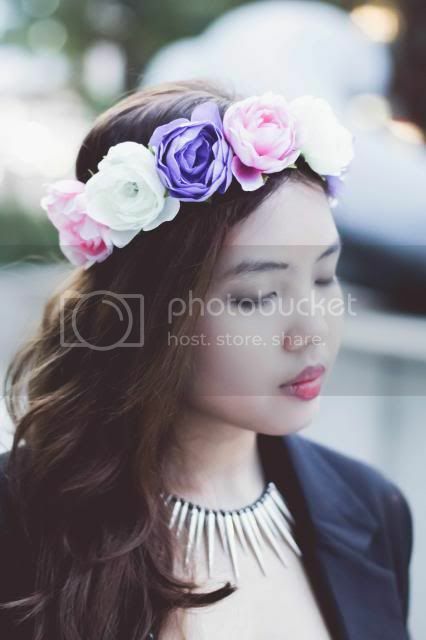 your flower headpiece looks just GORGEOUSSS! love it too much fhen! That floral crown is kind of amazing!